Nobel HD 50 is a high quality heavy duty mineral diesel engine oil formulated with an optimized combination of base oil and a balanced additive system. Good protection against rust and corrosion. Thermal and oxidation stability. Great engine cleanliness. They may also be used in diesel engines of commercial vehicles and contractor equipment. 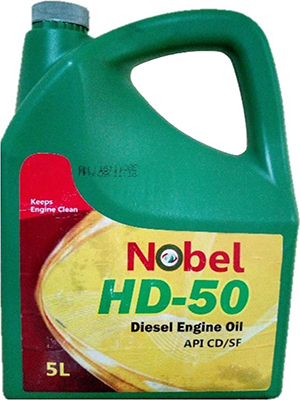 Nobel HD 50 is formulated from high quality base oils and an advanced additive system to provide the excellent performance required for modern combustion engines. They contain an effective balance of detergents and dispersants to minimise the formation of sludge and deposits, retain alkalinity (TBN) and reduce wear.